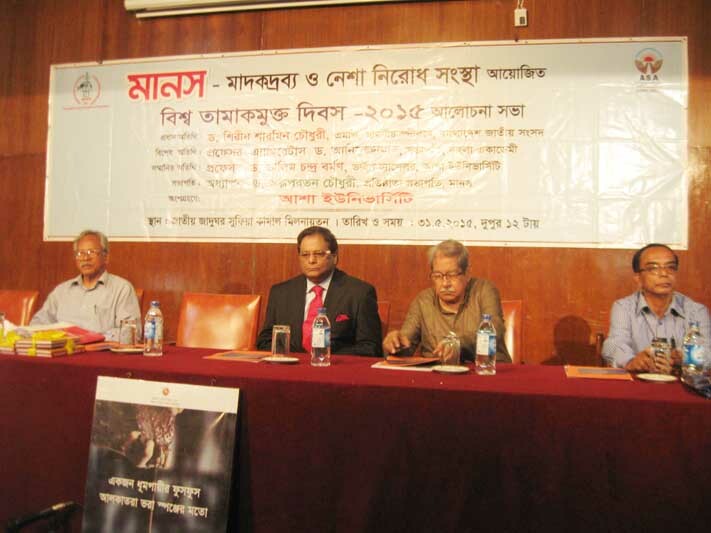 Students, Teachers and Officials of ASA University Bangladesh (ASAUB) have attended a discussion program on 31 May 2015 at National Museum Auditorium on the World No Tobacco Day-2015 organized by 'Association for the Prevention of Drug Abuse (MANAS)'. The propounded objective of this day is-`Stop Illicit Trade of Tobacco Products.' 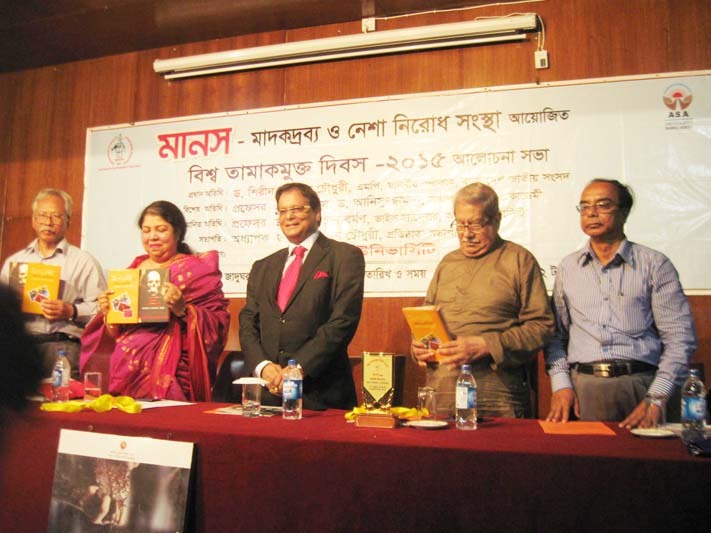 Dr. Shirin Sharmin Chaudhury, Honorable Speaker, Bangladesh National Parliament and Chairperson, Commonwealth Parliamentary Association (CPA) was present as the Chief Guest while Prof. Emeritus Dr. Anisuzzaman was present as the Special Guest in the discussion session. 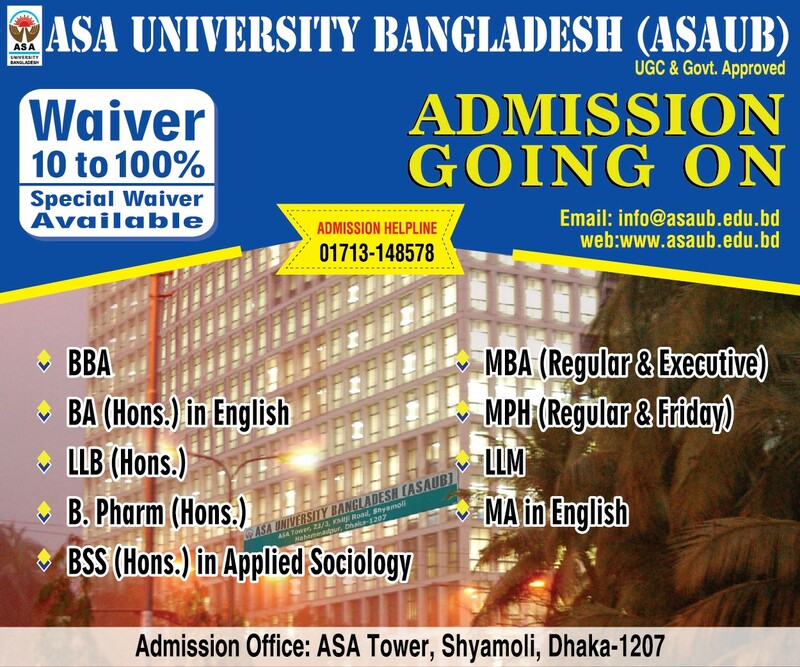 Honorable Vice Chancellor of ASA University Bangladesh (ASAUB) Prof. Dr. Dalem Ch. Barman was present as the Guest of Honor. Prof. Dr. Arup Ratan Choudhury, Founder President of MANAS was the keynote speaker and also presided over the program. The speakers said that percentage of smoking cigarette and taking other kinds of tobacco decreasing in the develop countries but this proportion is alarmingly increasing in the third world countries like Bangladesh. Cigarette and other tobacco products from more than fifty countries are now a days available in Bangladeshi market which come through illegal way. They also added that local tobacco businessmen give extra benefit to our farmers on the production of tobacco. Our land losing its fertility by the production of tobacco. The discussants urged to initiate more tax on the tobacco business which can certainly reduce a huge amount of national health cost. They also urged to take necessary steps for stooping illegal trade of foreign tobacco products. Mr. Matiur Rahman Talukdar, General Secretary of MANAS delivered the welcome speech and Md. Jayed, student of ASA University Bangladesh (ASAUB) delivered speech as student representative.